The Summer 2012 issue of FGBC World, the quarterly magazine for the Fellowship of Grace Brethren Churches, includes amazing stories of how several individuals came to know Jesus. In the magazine you’ll also learn what’s on the agenda for the annual Grace Brethren conference this summer in Indian Wells, Calif.; about efforts to encourage a ministry on the other side of the ocean; and details of a unique program that takes Grace Seminary classes around the world. Plus, you’ll read news about individuals and ministries in Grace Brethren congregations in North America. 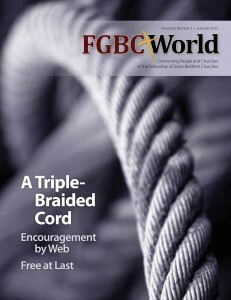 The magazine is available online at fgbcworld.com. Bulletin announcements have also been sent to pastors and churches. If you did not receive them, click here for immediate access. If you’d like a free subscription to the magazine, let us know at fgbcworld@bmhbooks.com.